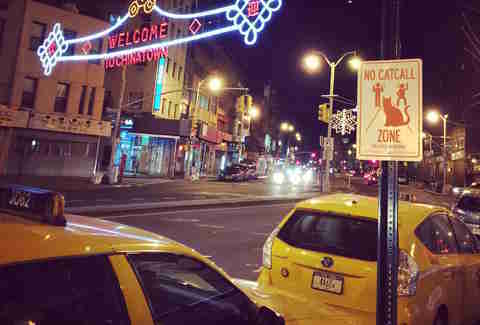 Because this is NYC and we need freaking signs to remind us to show basic decency and respect to each other, dozens of "No Catcall Zone" signs have appeared all over town in an effort to curb harassment and catcalling on the street. The signs were posted by Feminist Apparel, a non-profit anti-sexism and anti-harassment advocacy group, throughout the city last weekend in time for Anti-Street Harassment Week and to raise awareness around the issue of street harassment and catcalling in NYC. 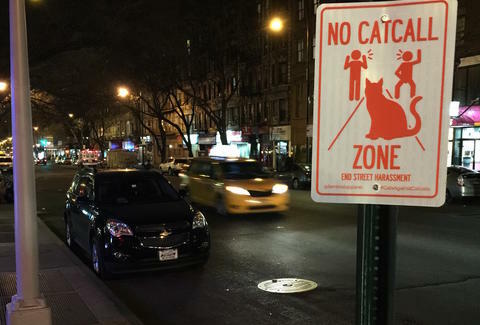 So far, over 50 signs have been added to street posts and polls scattered throughout Brooklyn and Manhattan, and advocates plan to post additional signs and stickers throughout the week, the group told Thrillist. "The timing of the signs going up is in coordination with this being Anti-Street Harassment Week," Feminist Apparel said in a statement. "We hope to get at least one sign up in each borough by the end of the week as street harassment and catcalling is obviously a universal issue not contained to any one neighborhood." Tony Merevick is Cities News Editor at Thrillist and thinks there should also be "No Flip-flops & Shorts" signs up right about now, too. Send news tips to him at tony@thrillist.com and follow him on Twitter @tonymerevick.